1 Dorset Square, home to the Alliance Française de Londres, once housed a section of the Special Operations Executive. During research into our building's war-time use we have been intrigued to discover some overlaps with the Resistance in Marseille. 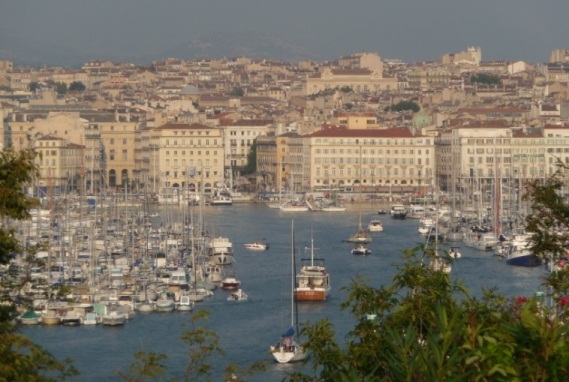 Nowadays, people do not spontaneously connect Marseille with the Resistance which is more commonly associated with Lyon from where Jean Moulin and the main networks operated. In keeping with this perception, Marseille does not have a commemorative museum or dedicated memorial (only street names and plaques). 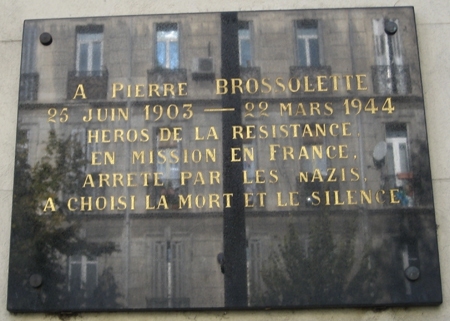 Yet Marseille was the setting for very early resistance activities, as early as the summer of 1940, before the word résistance was even used. As the biggest city and the only functioning port in the unoccupied zone, Marseille attracted scores of refugees who began converging in May 1940 - French from the occupied zone and Alsace-Lorraine, British soldiers, Belgians, Czechs, Poles, anti-fascist Italians, communist and anarchist Spaniards, anti-nazi Germans, including many intellectuals and artists, and many Jews. Added to these uprooted people, most of them transitaires, were numerous repliés (of the administration, newspapers, radio stations, and demobilised troops); that was a lot of newcomers flocking to Marseille, filling hotels (which even rented their bathtubs) and safe houses. The port was still trading with the empire and beyond, and the city was a gateway out of France, to Algiers, to London, to America, to freedom for some and more active fighting for others. 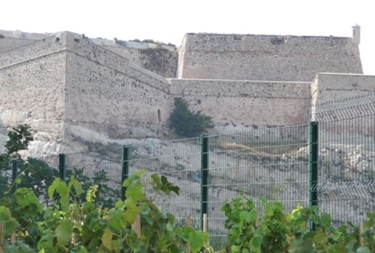 Escape lines and aid to refugees are now considered the first resistance activities in Marseille, though not so much political and ideological as humanitarian. 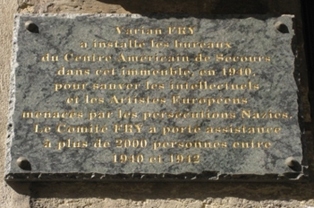 From mid-August 1940, American journalist VARIAN FRY and his rescue committee (with both official and clandestine activities) helped some 1,500 artists and intellectuals, many Jewish, including André Breton, Claude Lévi-Strauss, Anna Seghers, Arthur Koestler, Marc Chagall and Max Ernst to flee to the USA. Several sympathetic consuls (Czech and Mexican notably) signed false papers as part of the kafkaesque assembling of transit papers necessary for a chance to flee. Fry also helped smuggle out nearly 300 stranded British soldiers in liaison with MI6. 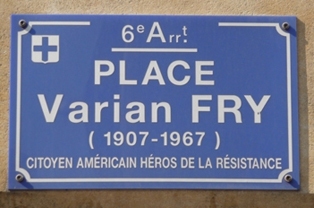 An irritant to both the American and Vichy governments, Fry was thrown out of France a year later but some of his colleagues carried on with the work and joined resistance groups. It took some 50 years for him to be recognised as “héros de la résistance”. As examining officer for Jewish candidates to immigration to the USA, on top of a heavy burden of consultations and visits to patients, a local doctor tried in conscience to pass as many as possible (he saw some 2,000) as fit to go. Another of his jobs was to pass as medically unfit as many interned allied soldiers and officers as possible so that they would be repatriated. He was therefore involved both with those helping people flee to the USA and with those organising passages to England. He was Dr GEORGE RODOCANACHI, born a British subject in Liverpool of Greek parents, naturalised French and living in Marseille, who was also caring medically for the men hidden at the SEAMEN’S MISSION at 46 Rue de Forbin, near the Vieux-Port, taken over in July 1940 by a Scottish presbyterian reverend, DONALD CASKIE. There the latter sheltered and fed hundreds of stranded British servicemen and escapers from Nazi persecution (one of them being one-armed James Langley, later of MI9) whom he helped escape via the Pat Line (of which more below). 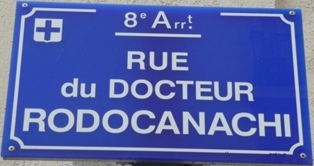 After the Mission was closed down by the police, Rodocanachi allowed his large apartment and bustling doctor's surgery, at 21 rue Roux de Brignoles,to be used as a safe house from June 1941 until his arrest in February 1943 (he died in Buchenwald one year later). His wife recorded that between these two dates they sheltered some 180-200 men (but more like 600 were processed there) from Britain and its dominions, Poland, Belgium, the USA. They provided a home from home, and a home on the way home, with a few rules like wearing slippers and no unnecessary lavatory flushing for fear of alerting the neighbours. They provided inter alia cups of Earl Grey tea and books in English, though meals were by necessity frugal. Another notable marseillais involved was anglophile businessman LOUIS NOUVEAU. In December 1940 he started welcoming British officers weekly at his home, a sort of informal club. Soon he lent them money, found other financial supporters, and with more and more crews crashing over France during bombing raids and needing to return to base, he started sheltering them in May 1941. His 19-year old son, Jean-Louis, had just used the escape line to rally the Free French (with whom he bravely fought and was made Compagnon de la Libération). One night in September 1941, Nouveau had 16 airmen in his apartment on the Vieux-Port, most of them British. Throughout he had kept a list of his secret guests, hidden in a volume of the complete works of Voltaire: it shows 156 people; among them were Virginia Hall (later in SOE and OSS), Airey Neave (on the run from Colditz and who later became an MP and Shadow Secretary for Northen Ireland), André Simon (son of an Alliance Française de Londres benefactor and future F agent) and d’Astier de la Vigerie’s son (in the Résistance). Nouveau undertook almost 50 journeys for the escape line. They were among the few and precious local helpers working with rescue committees and escape lines. 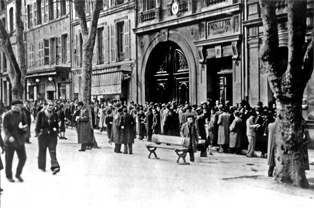 The PAT LINE, the first and most successful organised escape line, established its headquarters at Rodocanachi’s apartment (unbeknownst to Nouveau). Co-founded by Captain IAN GARROW, it got its name for the two-year leadership of Albert-Marie Guérisse, a Belgian doctor taken on by SOE under the nom de guerre PAT O'LEARY and posing as a French Canadian. It worked in liaison with MI6, MI9 and SOE in London and smuggled out hundreds of escaping and evading Allied servicemen and agents back to Britain, referred to as “parcels”, via the calanques of Cassis or the Pyrenees en route to Gibraltar. Today the most famous helper of this escape line is NANCY WAKE (who died in 2011 in London), “SOE’s greatest heroine”. A chance meeting in the bar of the Hôtel du Louvre led to her employment as a courier for Garrow. Her husband, wealthy entrepreneur and bon viveur HENRI FIOCCA, had, like Nouveau, many trade links with Britain which made him a rare anglophile, and he happily contributed money to this enterprise; the Fiocca’s vast appartment, then a safer one he provided for his wife, saw a lot of comings, goings and entertaining, initially of British officers under house arrest at the Fort Saint-Jean, then of escapers of various kinds. Their chalet in the Alps was also put to good use. Nancy, known as “l’Australienne de Marseille”, and Fiocca also acted as couriers and escorts to escapers. When the hitherto free zone was occupied, the Gestapo became aware of a troublesome and elusive agent whom they called The White Mouse. When the network was betrayed Nancy fled Marseille; Fiocca stayed behind and was soon captured, tortured and executed in October 1943. Unaware of this and after many péripéties, Nancy made her way to London with several people including Danielle REDDE. When they reached London, both joined SOE and were trained to go back behind enemy lines: Danielle was trained by RF section and was parachuted in February 1944 as radio operator. Nancy was parachuted back in April 1944 as assistant to John Farmer, running the circuit known as FREELANCE, part of SOE’s F section. 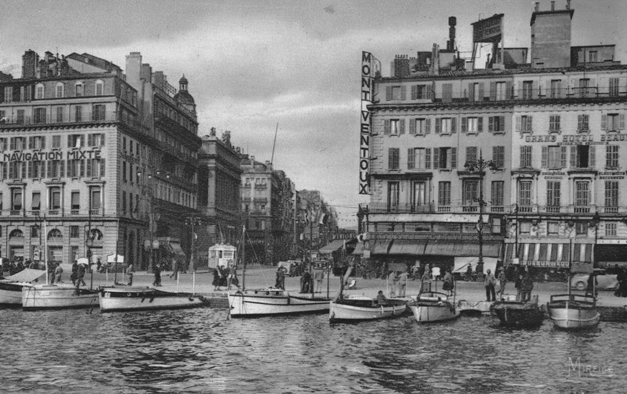 On returning to Marseille, Nancy met and befriended LOUIS BURDET. His story is among many described in the forthcoming book "RF IS FOR REAL FRIENDS" (see suggested reading below). His alias was CIRCONFERENCE, and he was sent, with his courier BINETTE, as military delegate for the Marseille region by the Free French and RF section of the Special Operations Executive. In civil life he was manager of the Hyde Park Hotel and after the war of the Stafford Hotel in London. He was involved in the installation of the plaque on Alliance House. Another native of Marseille, Admiral MUSELIER left the city on 23 June 1940 on a British collier and made his way to Gibraltar, thence to London. 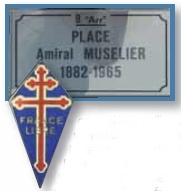 Muselier, put in charge of the Free French naval forces, gave the Free French their emblem, la croix de Lorraine, before falling out with General de Gaulle. The Alliance Française de Londres co-organised the public talk he gave in Westminster Hall on 1 May 1941. 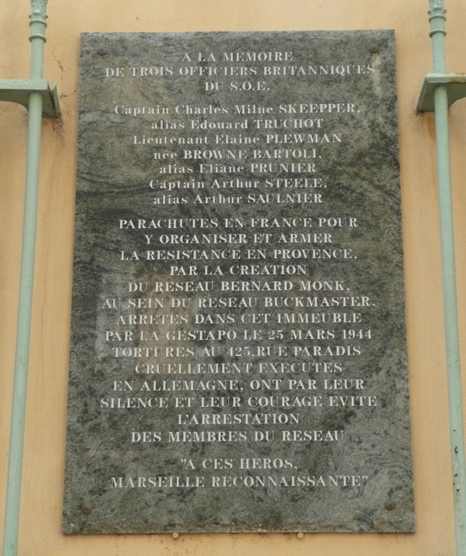 It was the arrival in Marseille of Captain HENRI FRENAY in July 1940 which has traditionally marked the beginning of the resistance in earnest in Marseille and the surrounding area. He articulated his vision in a manifesto and founded the MLN, Mouvement de Libération Nationale, which he merged the following year with another group into Combat. He recruited men and women to resist, he liaised with London, he worked alongside the Polish intelligence network F2. 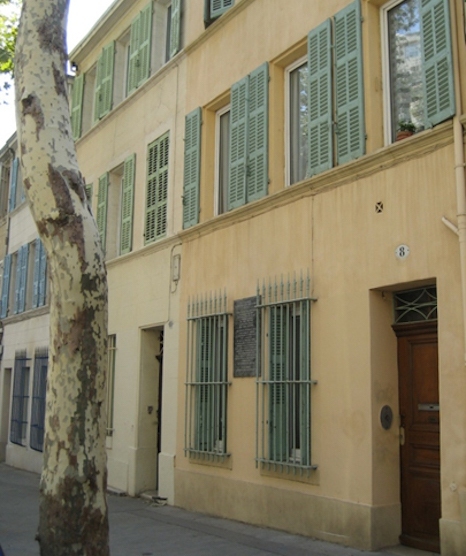 The home of a local doctor at 67 rue de Rome was where he hid, where he held his meetings, where he had his first meeting with Jean Moulin, concluded on a cool pastis. In early 1941 JEAN MOULIN began his 6-month stay in Marseille, staying at the Moderne Hôtel at the bottom of the Canebière, linking up with Frenay, Combat and other burgeoning networks. Indeed all the future major resistance leaders had converged in the port city at some point since the summer of 1940. The meetings Moulin had in Marseille informed his report to de Gaulle whom he went to meet in London to convince him of the importance of interior resistance. 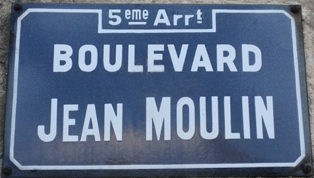 Moulin was instrumental in the link-up between the London Free French and southern resistance groups. He was parachuted back at the foot of the Alpilles in January 1942, with the mission to unify resistance groups on de Gaulle’s behalf. 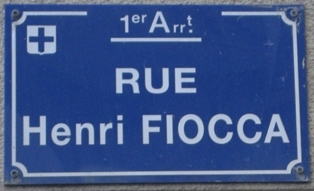 It was in Marseille that Captain PIERRE FOURCAUD, envoy of the BCRA/RF, formed a network called FLEURS, a “translation” of (Léon) Blum, which indicates the socialist leanings of the group. GASTON DEFFERRE, a young solicitor (to Fry’s refugees for example, and to Garrow), met him at his practice, quietly sending radio messages with his WT operator to London. Defferre joined the network, later renamed BRUTUS, of which he became the leader. He would be the mayor of Marseille in Sep. 1944-Oct. 1945 and then from 1953 until he died in 1986 (as well as several ministerial posts): his role in the resistance shaped his subsequent political career just as he shaped, profoundly, post-war Marseille. Like the Pat Line and the Polish network F2, other networks were working with the British secret services: the CARTE network, for a time based in Marseille and in Arles, well-known in Britain for its famous agent, ODETTE. And the ALLIANCE network whose leader, Marie-Madeleine Méric, later Fourcade (alias the hedgehog), a native of Marseille, operated from there for a time. 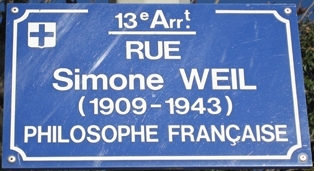 In this ville de tous les départs, one also finds philosopher, activist and mystic SIMONE WEIL, who lived with her parents for 20 months at 8 rue des Catalans, facing the sea. She was taking part in the early resistance activities (writing in and disseminating a clandestine newssheet, helping internees...) before leaving for New York in May 1942, en route to London, where she arrived in November. There she worked for the Free French and tried unsuccessfully to be recruited by the BCRA and trained by RF Section in order to be sent back to France on a special mission. Her fragile health was worsened by her asceticism and she died in a sanatorium in Ashford in August 1943, aged 34. JEAN GIONO, the writer from Manosque in Provence, spent 2 months in 1939 in the Fort Saint-Nicolas prison for signing pacifist tracts. 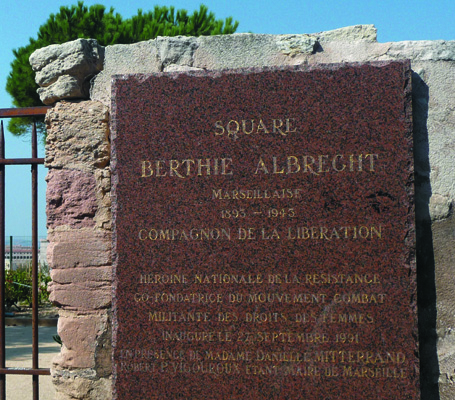 Closer to us and Alliance House, an RF agent also spent 2 months there, at the end of 1941, from where he spectacularly escaped: ERNEST “Charles” GIMPEL, was working with his father and brother for F2 since the summer of 1940, as well as for the first resistance network in Marseille, the small company AZUR TRANSPORTS, based at 40, rue Saint-Basile at the top of the Canebière. After his escape “Charles” made his way to London where he joined SOE and was briefed at 1 Dorset Square before a new perilous mission in occupied France. Read his gallant story and how he met with his wife, Kay, in RF IS FOR REAL FRIENDS. There is a video trailer about René Gimpel, Charles' father, here. After the Allied landing in North Africa, German and Italian forces invaded Marseille and Provence in the night of 11 November 1942. The Free Zone was no more: it was now the Southern Zone. Humanitarian and escape networks were badly hit, waves of arrests dismantled networks. They adjusted to the new circumstances, morphed, merged. As mentioned above, Moulin coordinated the merger of Combat, Libération, Franc-Tireur into the MUR (Mouvements Unis de la Résistance). The rest is history. "RF is for Real Friends" describes the little known RF section of the Special Operations Executive that operated out of 1 Dorset Square, now home to the Alliance Française de Londres. What is now Alliance House was once known as "spy corner" and it housed some remarkable people. Some of them are mentioned above and the book contains more about Burdet, BINETTE, Redde and Gimpel. Wing-Commander Yeo-Thomas is the most famous RF agent but OBT, whose mother was from Marseille, also worked for RF. Seeds, the section's first training officer, had spent 8 months in Marseille with the BEF. A number of southern maquisards were briefed at Dorset Square as RF co-organised their missions. The bars of the Vieux-Port offered a view of the sea and so hope of departure to the clientele of exiles who sat around the port whiling away the hours, the days, anxious for news of ships or police movements, looking nervously at the various expiry dates on their transit papers. André Breton and other surrealists played cadavre exquis and invented their very own jeu de Marseille tarot at Le Brûleur de Loups, whose name they found inspiring and which was for them another Café de Flore; Anna Seghers et al used to patronise Le Mont-Ventoux - it’s been remarked that the communists and the extreme-left surrealists did not mix. Nancy Wake liked to dine at Basso’s, also the place where Garrow and his friends liked to have the apéritif. Airmen came to know that Le Petit Poucet bar on Boulevard Dugommier was the place to go to and wait to be retrieved. Free French and British secret agents met up in the backroom of the Sans-Pareil on the Canebière. They drank pastis, wine or ersatz coffee and used bread coupons to buy a slice of pizza. Vieux-Port (Quai des Belges): from the corner with La Canebière, le Mont-Ventoux, le Brûleur de Loups, le Cintra next to each other. Basso is the next building on the right. The network was betrayed and they were arrested in March 1944. After 3 weeks of interrogation by the Gestapo at 425 Rue Paradis, they were imprisoned near Paris. On 13 May Eliane was transferred with seven other SOE female agents, including Odette, to Dachau where she was executed in September. Skepper and Steele died in Buchenwald. BERTHIE ALBRECHT née Wild was born in Marseille in a protestant bourgeois family. Educated in Marseille and Lausanne, she was a nurse in WWI before marrying a Dutch banker. In 1933, mother to Frédéric and Mireille, she started a feminist review, Le problème sexuel, campaigning for contraception and abortion rights. Meanwhile she became a social worker in a factory and sheltered at Sainte-Maxime refugees from Nazi persecution and Spanish republicans. A friend of Frenay despite their political divergences, they edited clandestine newssheets and then founded Combat together. An active resister in Lyon, she was arrested twice in 1942 by the Vichy police, and arrested again by the Gestapo in March 1943. Tortured in Lyon, she hung herself the night she arrived at Fresnes prison rather than risk speaking. Out of the 1038 Compagnons de la Libération, she is one of the 6 women thus honoured by de Gaulle, and one of the 16 resistance fighters buried at the Mont-Valérien memorial site. Nancy Wake had first come to Marseille as a reporter in October 1934 to cover the visit of King Alexander of Yugoslavia (a Kingdom formed after WWI) and witnessed his assassination and that of the French foreign minister by a nationalist. “I made my way to the Canebière and took up my position on the steps of the Bourse to watch the King go by. The crowds began to cheer as the carriage approached but then came the sound of shots being fired. Someone shouted that they had shot the King and then all hell broke loose. Marseille crowds are never very orderly when things are normal, but let someone loose with a gun and they become more dangerous than the person with the gun. I put on a performance that would have done credit to an Olympic runner and reached my hotel in record time. [...] very soon the police shouted for me. My name was on the hotel register and I was a foreigner into the bargain. It’s really extraordinary, but in every country in the world, foreigners are always suspected before anyone else. [...] I had experienced months of shouting in Paris and no Marseille flic was going to outshoot me.” (N. Wake, The Autobiography of the Woman the Gestapo called the White Mouse, Macmillan 1985, p.7-8). There is a film of the assassination, the 1st time such an event had been caught on camera. One can see twice the “Mont-Ventoux” bar. This newsreel would be shown in cinemas to great emotion. To view the video click here. This commemorative plaque was the setting of the 1st public demonstration of hostility to the Nazis. 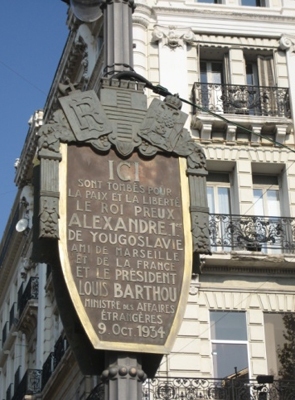 It was festooned with flowers on 28 and 29 March 1941 to applaud the Yugoslavs resisting the Nazis. La Marseillaise was sung, bouquets were thrown out of tramways by passengers, students marched past. Flower shops were closed and the crowds were dispersed. © CH 2013. This page is an extract from research in progress. You are welcome to quote any of the above and it will be appreciated if you would kindly acknowledge this research and include a link to this page.